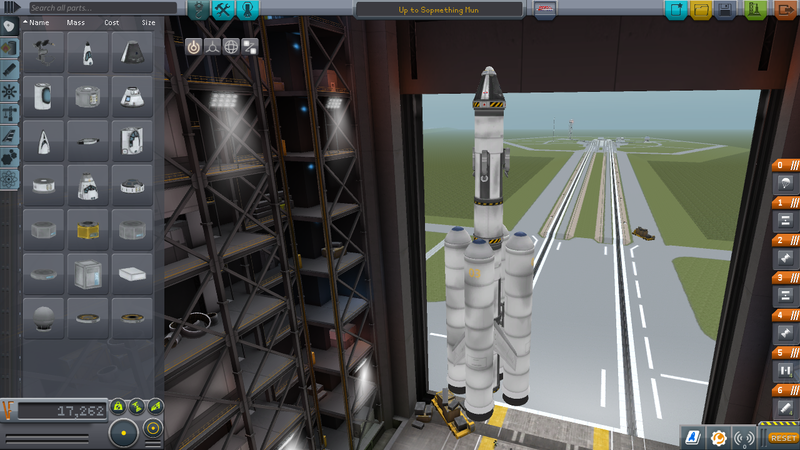 For our first launch we plan on just getting into the air very high, and if we can safely get into orbit we will achieve milestones, and get safely back to Earth. We will be using a simple rocket with boosters and fuel tanks to minimize cost, but maximize our success. Pre-Flight Briefing #2: In this mission we will be teaming up with Nicholas Enterprises to use our shared skills and to get into orbit. We will have a more in depth pre-flight briefing to ensure a more successful launch compared to last time. We are splitting the cost 50/50, but 30% of our reward money will go to Nicholas Enterprises. Design Goal: Our design goal in this mission is to have a rocket, with sufficient fuel and boosters to get us into orbit, and then enough fuel to be able to get out of orbit and back into the atmosphere. The rocket is composed of decouples to get rid of dead weight, and the command pod has heat shields and a parachute for safe landing back to earth. Launch Goal: On this launch, our ultimate goal is to get into orbit, and subsequently complete the milestones for launch and manned launch to 10k,manned launch to 50k, getting into stable orbit, manned stable orbit, and doing all this to return to land safely. Also, if we are in good shape, we will do a Kerbal EVA. Pilot Plan: Our plan for our pilot, Bob, is to use the SAS system to help us stay on track in getting into orbit. Also, with the piloting skills of Marcus Nicholas, he will help us with maneuvers getting into orbit, and getting back to earth safely. All illustrations for will be presented in our post flight briefing. Design Goals: Our vehicle is designed to possess maximum thrusting power in order to leave Kerbin's atmosphere, achieve stable orbit, and successfully achieve our first Kerbal EVA after orbit is established. Pilot Plan: We will use the SAS system to help us stay on track in getting into orbit. Our plan is to fly vertically upward, then rotate our rocket to about 65 degrees, then decouple our thruster when out of fuel. We will attempt to achieve a parabolic arc path. Once we have reached a certain altitude, we will accelerate to the horizon until stable orbit is achieved. Illustrations: We forgot to take screenshots of our rocket and during our flight. Play-by-Play: The rocket left the launch path, accelerating vertically until an altitude of 80,000 km was achieved. At that point, our thruster was decoupled. We then angled towards the horizon, eventually rising to a level at which a parabolic arc path was achieved. We successfully achieved orbit. 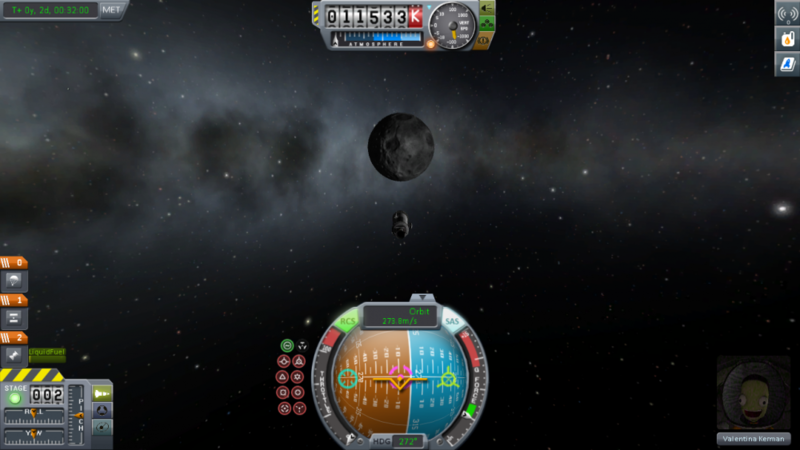 After achieving orbit, we attempted our first Kerbal EVA, which was successful. 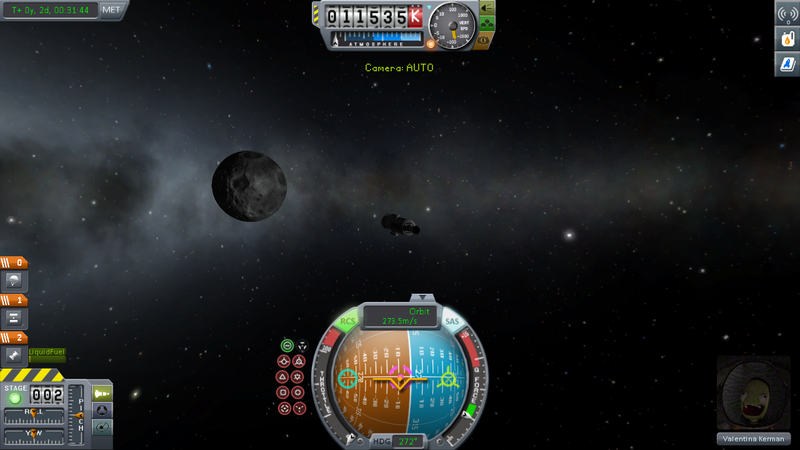 We then exited orbit by thrusting in the direction of Kerbin, and were worried as our pilot had to eject and deploy his parachute. He did land safely, however. Photographs: We failed to take screenshots..
Summary: We achieved all of our desired milestones, indicated in the pre-launch debriedf. Opportunities / Learnings: Our team learned of the importance of heat shields, as our rocket very nearly began to overheat. Strategies / Project Timeline: Going forward, we recognize the need to experiment with different engines and command pods in order to try new things to achieve more difficult milestones. We also need to create a pilot plan in greater detail in order to more efficiently and effectively achieve our milestones. What happened after your pilot deployed his parachute? This past Friday at Arts Fest, we brought Kerbal Space Program into the real world. Every year at Arts Fest, the Physics 1 students are given a project in which they need to construct a rocket out of a 2 Liter bottle, which is then launched on the track. If the rocket is in the air for at least 7 seconds, full points are awarded. This year, Mr. Fullerton gave all of his Physics C students the same project. If our rocket remained in the air for at least 7 seconds, then our reward would be 100,000 kerbency for our team in Kerbal Space Program. Our team, Stack B Nimble Corp., received the full reward. Our rocket remained in the air for 8.23 seconds, a better time than we expected. 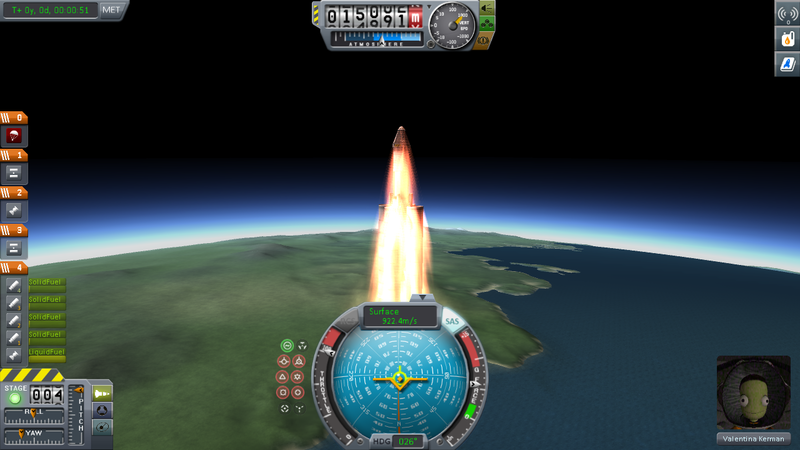 This launch was nearly identical to our third launch, except we remembered to take screenshots. 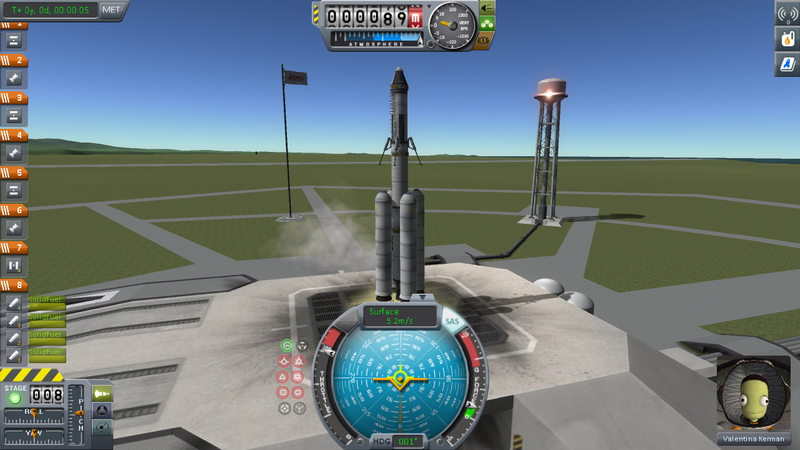 Design Goals: Our vehicle is designed to possess maximum thrusting power in order to leave Kerbin's atmosphere, achieve stable orbit, and return safely to Kerbin. Play-by-Play: The rocket left the launch path, accelerating vertically until an altitude of 80,000 km was achieved. At that point, our thruster was decoupled. 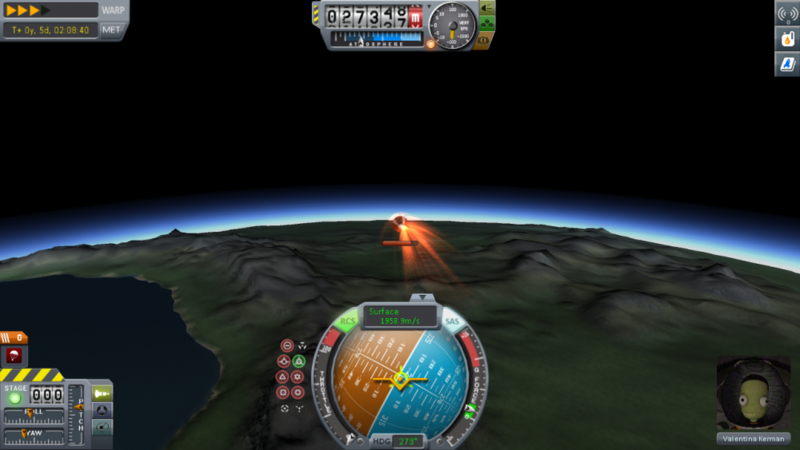 We then angled towards the horizon, eventually rising to a level at which a parabolic arc path was achieved. We successfully achieved orbit. 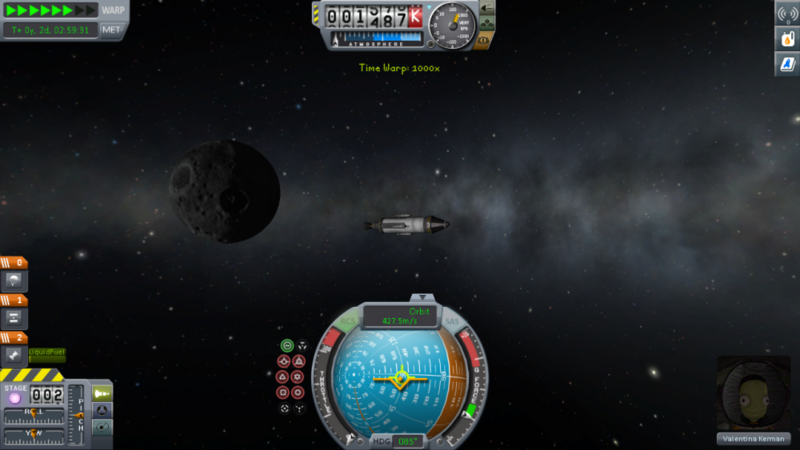 We then exited orbit by thrusting in the direction of Kerbin, and were worried as our pilot had to eject and deploy his parachute. He did land safely, however. Summary: We achieved all of our desired milestones, indicated in the pre-launch debrief. Opportunities / Learnings: Our team learned of the importance of heat shields, as our rocket very nearly began to overheat. We also learned the importance of making sure we have ample fuel to achieve our desired milestone; we ran low on fuel near the end of the launch. 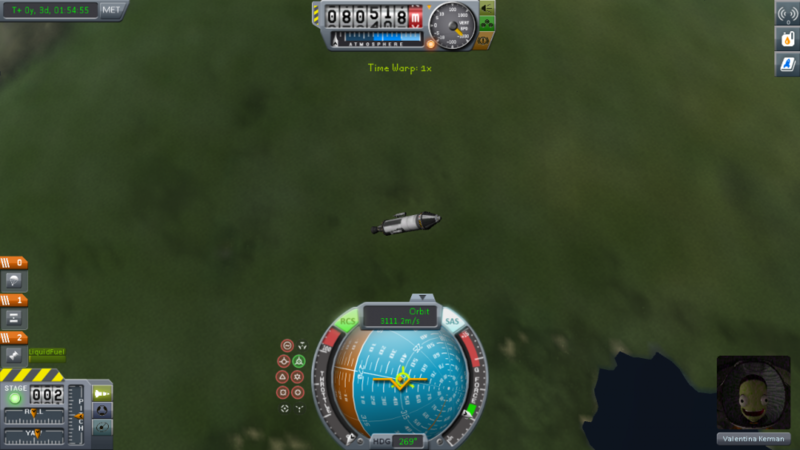 Had we ran out of fuel, we may have been unable to return to Kerbin's surface. Strategies / Project Timeline: Going forward, we recognize the need to experiment with different engines and command pods in order to try new things to achieve more difficult milestones. We also need to create a pilot plan in greater detail in order to more efficiently and effectively achieve our milestones. 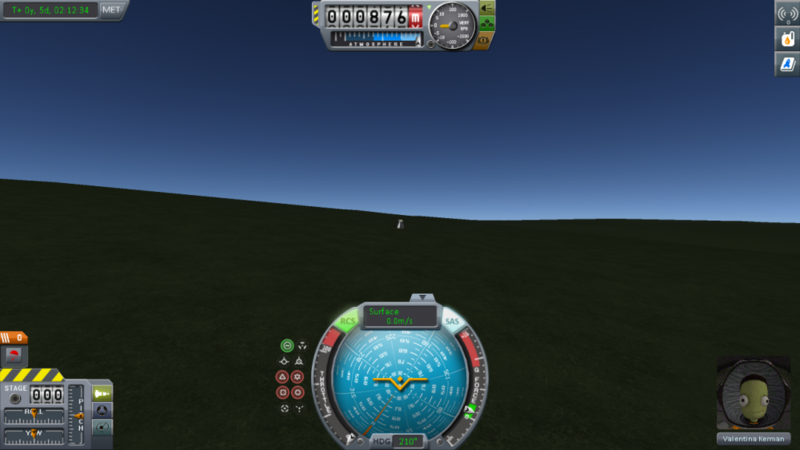 More than anything, we need to continue gaining experience in KSP, as it is a very new game to all of us, and learn all of the little tricks of the game in order to truly succeed. Design Goals: Our satellite is designed to possess maximum thrusting power in order to leave Kerbin's atmosphere and achieve stable orbit. Opportunities / Learnings: Our team learned of the importance of heat shields, as our rocket very nearly began to overheat. We also learned how to more successfully maneuver in order to achieve orbit, which has been a source of difficulty for us. We also learned from previous launches to make sure that we had enough fuel to achieve our desired milestones, and we did. Looks like you're making progress, but hopefully your pilot doesn't have to test out his parachute next time. Looks like you're having some trouble embedding pictures... please see me or one of your classmates for the next mission reports so we can see a visual record of your triumphs! Pilot Plan: We will use the SAS system to help us stay on track in getting into orbit. Our plan is to fly vertically upward, then rotate our rocket to about 65 degrees, then decouple our thruster when out of fuel. We will attempt to achieve a parabolic arc path. Once we have reached a certain altitude, we will accelerate to the horizon until stable orbit is achieved. 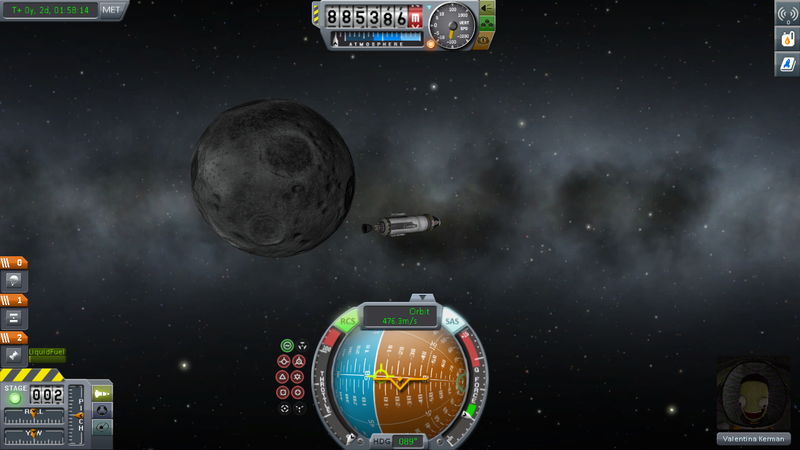 Once orbit is achieved, we will calculate the angle at which we need to accelerate towards Mun and will attempt to land. When at the appropriate altitude, we will accelerate away from Mun's surface in order to land at a reasonably low velocity in order to make sure our rocket remains intact and that our pilot Bob stays safe. Play-by-Play: The rocket left the launch path, accelerating vertically until an altitude of 120,000 km was achieved. At that point, our thruster was decoupled. 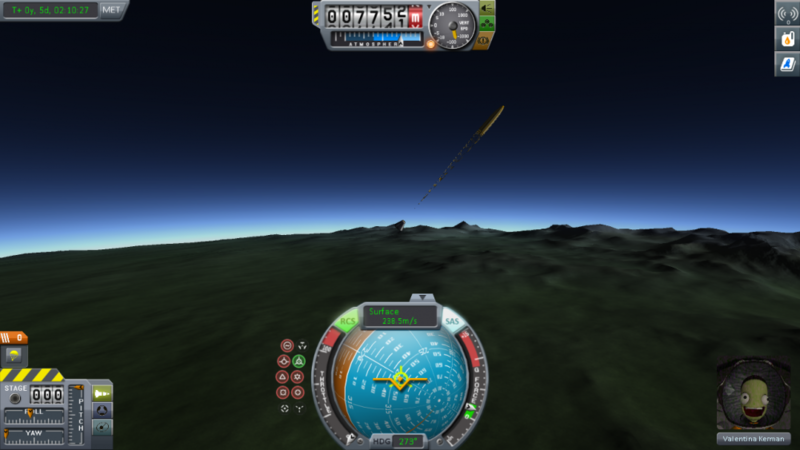 We then angled towards the horizon, eventually rising to a level at which a parabolic arc path was achieved. 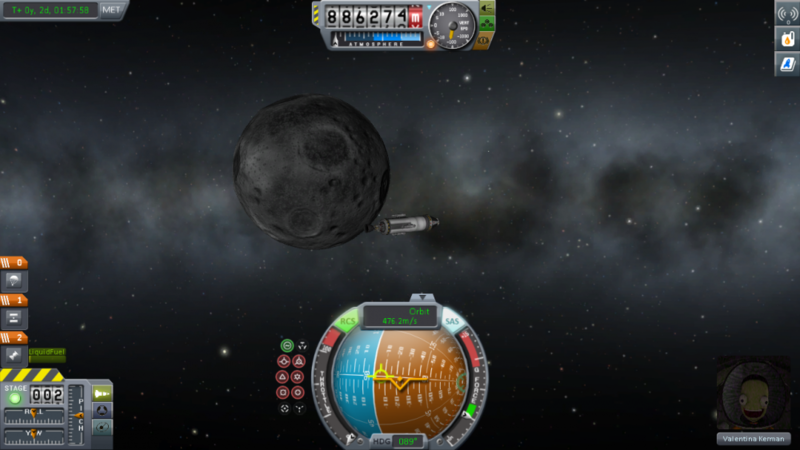 We successfully exited Kerbin's atmosphere and accelerated towards the Mun. Once we got to Mun, we successfully orbited Mun, considering an attempt to land on Mun; however, the attempt was too dangerous as our fuel levels were too low. We then exited orbit by thrusting in the direction of Kerbin, our pilot ejected his parachute when at the appropriate altitude, and landed safely. 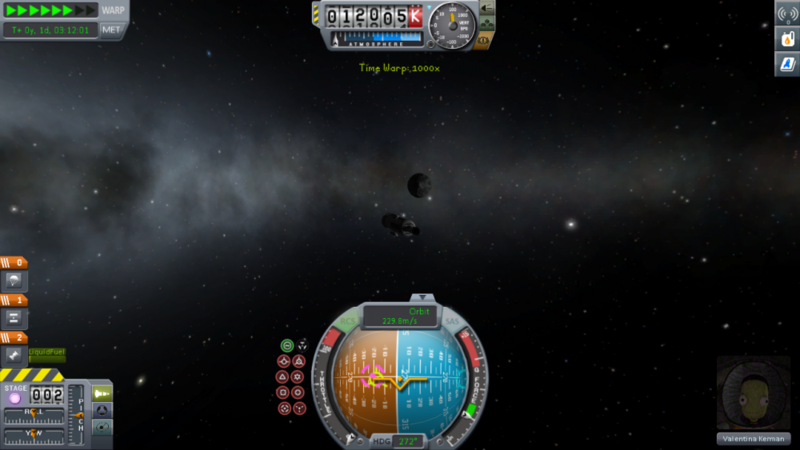 We returned Bob Kerban safely to Kerbal. His family dearly missed him and they're happy he's home safe. Opportunities / Learnings: Our team learned of the importance of heat shields, as our rocket very nearly began to overheat. We also learned how to more successfully maneuver in order to achieve orbit, which has been a source of difficulty for us. 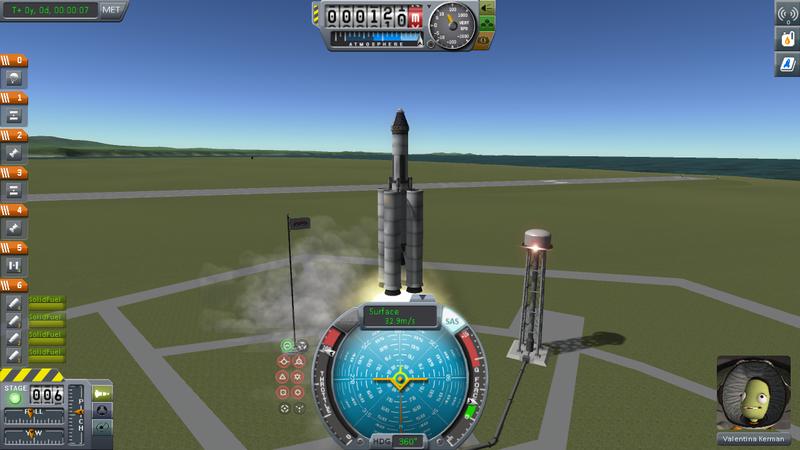 Although we thought we had learned from previous launches to make sure that we had enough fuel to achieve our desired milestones, in this launch we did not. We need to more thoughtfully calculate how much fuel we will need in the future. Strategies / Project Timeline: Going forward, we recognize the need to experiment with different engines and command pods in order to try new things to achieve more difficult milestones. We also need to create a pilot plan in greater detail in order to more efficiently and effectively achieve our milestones. The pilot plan of this launch was better and had more detail than previous launches; however, the pilot plan can still be improved. Nice report, and I love the pictures!